During yesterday’s MySQL Connect conference, Brandon Johnson and I gave a joint talk about how Mozilla uses puppet to manage hundreds of MySQL servers efficiently. We also released our mysql puppet module on github, so that all can benefit. The slides for the talk are at http://bit.ly/puppet-mysql-slides. I am about to give a talk at MySQL Connect about what you need to know before upgrading to MySQL 5.6. The PDF slides are online at http://bit.ly/upgrade56. The feedback has been excellent, so I hope that you find this video useful when trying to learn how to use performance schema and dive into the depth of the information it provides you. Comments Off on 2013 SkySQL and MariaDB Solutions Videos Are Online! However, we saw these errors again when we upgraded to Perconas MySQL 5.1. At first we thought that it was because Oracles startup script is /etc/init.d/mysqld and Perconas is named /etc/init.d/mysql (so we would put ulimits in /etc/sysconfig/mysql). However, when we looked, we saw that Perconas startup script does NOT source anything in /etc/sysconfig. We restarted MySQL and all was good. Even though we are long past having this problem, I thought it was important enough to blog about. 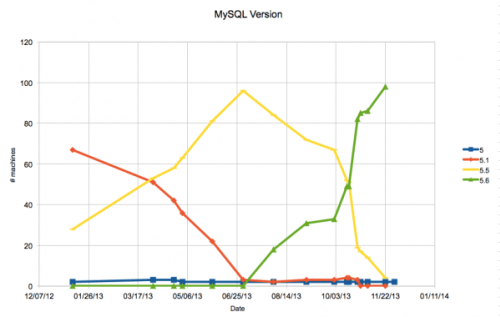 * We finished upgrading all of our servers to MySQL 5.1 at the end of 2012. We ran into this interesting snag that I wanted to blog about, even though were in the middle of upgrading to MySQL 5.5 right now (and by the end of the year, we will upgrade to MySQL 5.6 the performance schema stuff is definitely something we want to utilize).